Even stuck on our large island on the edge of the Atlantic, it is impossible to ignore the European influence in our lives. And computer games, like music, are something of an international language, particularly those of the shoot-’em-up variety. While Alan Sugar informs us, in a dull monotone, that EEC trade barriers are set to fall in 1992 most European software houses are already chomping at the bit to participate in the lucrative UK market. While several French software producers have been around for several years, and happily exported their games into other continental countries, only one or two have proved successful in the UK. The two founders of Infogrames — former chemical engineers Bruno Bonnell and Christophe Sapet — claim that the company was established at the bottom of a garden in Lyon. They both shared a passion for computers and borrowed same money from family and friends alike to start their own software firm. Infogrames has had success on all the major formats throughout Europe, including the UK where it first entered the scene in the summer of 1986, with the role-playing adventure Mandragore (79%, Issue 32). This minor success was soon followed by the positively French-flavoured murder mystery adventure L’Affaire Vera Cruz (85%, Issue 34). Two more excellent Spectrum adventures were released in 1987. As in L’Affaire Vera Cruz, The Sidney Affair (86%, Issue 40) put the player in the role of a diligent detective, trying to solve a murder. Inheritance (86%, Issue 41) was a three-part adventure about an eccentric aunt’s strange will, requiring you to win a million dollars in a Las Vegas casino to claim your inheritance. A change from this spate of adventures was Prohibition (59%, Issue 43) where gun-toting gangsters suddenly emerge from behind the scrolling scenery to fire at you. Despite some beautifully-drawn characters the game was not thought to be up to Infogrames’ high standards. But some five months later, Sidewalk (87%, Issue 48) appeared with more game content to go with the detailed graphics. Since then, Infogrames have rather neglected the Spectrum, but with the massive success of Captain Blood (released on one of Infogrames’ other labels, ERE International) in its Atari ST form, a Spectrum version of this classic space adventure is due before Christmas. Also coming to the Spectrum in the near future on Infogrames’ Cobrasoft label is Action Service, which takes place in an army-training camp where assault courses featuring barbed wire rope swings and vicious Alsatians. Should all this is be too easy for you (or too hard) alternative courses can be designed with the included construction kit. And finally if you ever wanted to jump off buildings (don’t do it!) or roll your car over umpteen times (certain people at Newsfield have already attained this feat) (although no-one on CRASH yet touch, wood! — Ed), Stuntman is promised to deliver all the thrills and spills of the real thing. It looks like Infogrames are back with a bang on the Spectrum scene. 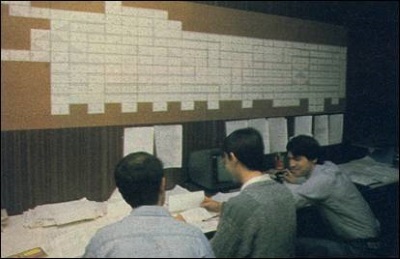 Way back in 1983, two young Frenchmen, Laurant Weill and Marc Bayle founded the software company Loriciels. It was an instant success story; after only six months they’d set up their own marketing and publicity department — helping the new software house to sell over 200,000 units (cassettes or disks) in its first year of existence. Yet rather than concentrate purely on the games side of the business, Loriciels also became involved in producing languages and utilities. Marc and Laurant’s ambitious aim was to innovate in every type of software. Soon after its founding, the rapidly expanding Loriciels formed its own distribution division, called Loridif, and to allow retailers to order software 24 hours a day, a Minitel (see Infogrames) ordering service was initiated. To further expand the horizons of this extraordinary company Marc and Laurant also developed two further divisions: Priam, specialising in both educational and business software, and Microids, which as well as producing simulation software, develops micro and domestic robots. By 1987 Loriciels was a runaway success in Europe, but had yet to make a significant impact on the UK market. Made cautious by the failure of other European software houses here Laurant Weill decided the only way to succeed was to create an autonomous UK company, Loriciels Ltd, whose formation was announced at last year’s PCW show. The British company employs Nikki Penny as Product Manager for the UK and uses Elite Systems as a distribution agent. This contrasts with Loriciels’ expansion in the US markets, where its products are handled via the existing American software house Broderbund (only seen on the C64 over here). Naturally Loriciels’ ambitious plans in the UK include the country’s biggest selling games machine — the Spectrum. Jumping to the fore is a renamed French skiing game, Eddie Edwards: Super Ski, already released on various other machines. Other planned titles due next year include Space Racer, a sort of ‘road blasting’ game with a jet-bike instead of a car, and Turbo Cup which involves driving a Porsche at high speeds. Loriciels are planning to sell the latter in a package containing a model Porsche, but certain high street chain stores object to the extra trouble involved — so it’s doubtful whether this will now happen (pity, I’ve always wanted a Porsche — Ed). The original French software company started as a development house writing for other French publishers until 1987, when they developed their own product — the very playable racing game Crazy Cars (65%, Issue 52). However, this was not released in the UK until Titus (UK) was set up and launched in December 1987 by the British company Entertainment International. Crazy Cars was first released here on the Amiga, Atari ST, with 8-bit versions following three months later. This is because all Titus products are developed on the 16-bit machines, but with the 8-bits in mind. Due to Amstrad’s considerable market strength in France, the French company employ a team of specialist Z80 programmers, ensuring that both Amstrad and Spectrum versions are well implemented. Titus have recently had considerable success on the 16-bit machines with yet another driving game. Fire And Forget involves blasting down roads in some of the world’s troublespots, battling with enemy tanks and helicopters, while collecting fuel pods. This action-packed game is currently being converted to the Spectrum, and from the screen pics we’ve seen, it looks very promising. Thus also have two new Spectrum releases lined up for the new year. First is Galactic Conqueror, a space 3-D shoot-’em-up, containing over 400 planets on which to do battle. It is promised to contain plenty of strategy, as well as fast arcade action and is due for a January release. Titus are obviously revving up their engines for a bright future. Spain is the second-largest Spectrum-owning country in the world (after the UK), but only two of its software companies have broken into the UK market and both through deals with British software houses. Spain’s leading software house was formally founded under the name Microdigital Soft back in 1986, but the founders of the company had already been publishing games under The Dinamic name over a year earlier. Two of these early games, the boxing game Rocco (70%, Issue 19) and the arcade adventure Profanation (78%, issue 19), were licensed in the UK by Gremlin Graphics. But it was in 1986 that Dinamic had one of its greatest successes in Britain with West Bank (84%, Issue 25), again licensed by Gremlin. The action takes place in a Wild West bank, where you try to prevent a variety of baddies from robbing the bank. Other releases that year included two Code Masters games, Phantomas and Vampire as well as Camelot Warriors (licensed by the now-defunct Ariolasoft). 1987 saw further UK success, this time through Ocean/Imagine with titles such as Army Moves (54%, Issue 41), Game Over (55%, Issue 44), and Freddy Hardest (87%, Issue 47). Then came Dinamic’s most successful Spanish-selling game to date (although not really a best-seller over here), Basket Master (73%, Issue 51) — selling over 90000 units in Spain, making it Spain’s highest selling computer game EVER! In three successful years the company has expanded into a group of enterprises covering marketing, publicity, distribution and publishing. This group of related enterprises gives Dinamic an advantage over its competitors, as the Microdigital Soft group controls all the areas between production and retail. Naturally, now the contract with Ocean expired, Dinamic are launching a direct assault on the UK market. They have recently signed a deal with Electronic Arts who will be distributing their products throughout Europe (excluding Italy, Portugal and of course, Spain). The first game released under the new deal was Game Over II, which received a respectable 60% last issue. Early next year should see the release of the sequel to Army Moves. The action in Navy Moves will take place on the sea and will involve sailing across the horizontally-scrolling screen, fighting against enemy boats. Then it’s time to don your wetsuit and dive into the deep blue ocean, equipped with a harpoon to fight off dangerous sea creatures such as octopuses and sharp-toothed sharks. Two further releases are already planned for 1989: Aspar GP Master and After The War. ‘What does Aspar mean?’, you ask. Well apart from meaning ‘slipper’ in Catalan (PUKE — Phil’s Useless Knowledge Encyclopaedia) it is the name of Spain’s most famous (never heard of him) motorcycle champion on whose racing exploits the game is based. Not surprisingly the game may be renamed for its release in the UK. After The War promises to be a novel beat-’em-up, including both armed (with machine guns!) and unarmed combat. Dinamic hopes to have a truly dynamic future in The European software market. Toposoft have recently had success with Mad Mix Game (which earned an impressive 85%, last issue). This PacMan-style game features twelve levels of crazy action, including oodles of whacky features — the Spectrum version was written by Raffaele Gomez. However not many people realise that the Spanish programming house had earlier success in Britain with other Spectrum games, through various British software houses. The most notable of these early titles was Survivor (70%, Issue 44), released again by US Gold. This arcade adventure featured a massive spaceship play area with some very colourful graphics. Although Toposoft don’t have the financial ‘muscle’ of their compatriots Dinamic, they too are aiming to continue their success in the UK. Despite the popularity of home computers in Germany and plenty of specialist magazines such as Happy Computer, German-produced software is still fairly thin on the ground compared to France and Spain. But two programming houses have managed to sell their products over the English Channel, via major UK software houses. Rainbow Arts is one of a group of labels marketed by German trade agency, Softgold. Rainbow Arts’ software is being distributed in the UK by US Gold. Unfortunately their first intended release in the UK, The Great Giana Sisters (92%, Issue 55) will never be released due to the hassling from Nintendo, who reckoned it looked too much like Super Mario Brothers (fair enough, it looks a bit like it... well, it they’d produced a decent SMB in the first place it wouldn’t have been needed, would it?). But even worse luck was to follow, Rainbow Arts’ next scheduled release Katakis, was also withdrawn, this time due to the threat of legal action from Mediagenic (owners of Electric Dreams), who weren’t pleased at the game’s resemblance to R-Type (CRASH Smashed in this issue). And it looks like the planned The Great Giana Sisters II — Arthur And Martha in Future World will also never see the light at day. What an unlucky bunch of chaps, you may think. But never mind, Rainbow Arts still have some more goodies (provided no other company objects) with the strange cave game, Realm Of Trolls (probably not to be seen on the Spectrum, though) and the even more ominous-sounding Mutant Hell. Rainbow Arts always guarantee addictive, playable and original games. The other German software house which has broken into the UK market is Magic Bytes, who recently released — via Gremlin Graphics — Pink Panther across all the major formats. Unfortunately the game was not well-received, so let’s hope that their future releases, including another licence, Tom And Jerry, are a mite better. Also due for release in 1989 are Night Dawn and USS John Young. More details about these and other Bytes releases will be appearing in the Previews section within the next few issues, so watch that space!